Boulder, Colorado. September 19, 2014 – An employee who has worked for Ball Aerospace & Technologies Corp. for more than 40 years has been selected to receive the NASA Exceptional Public Service Medal for outstanding contributions to a NASA mission. 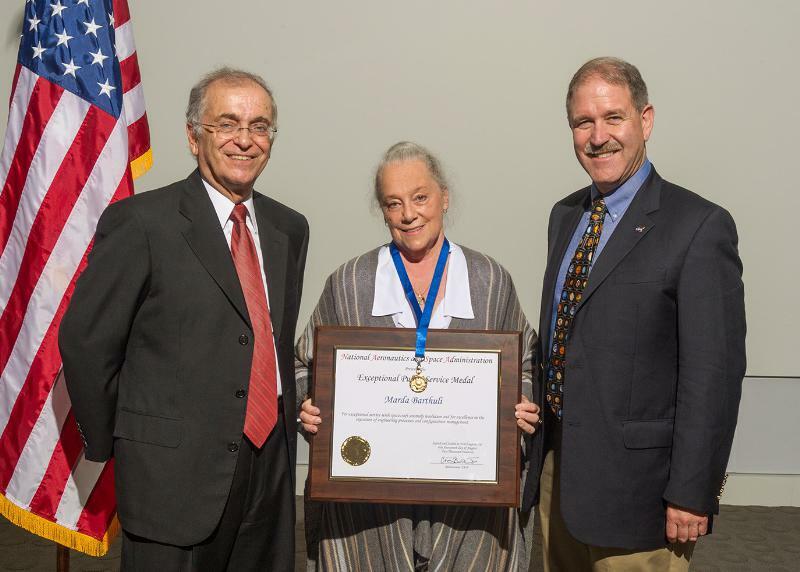 Marda Barthuli has been recognized for excellence in helping resolve a spacecraft anomaly and for the execution of engineering processes and configuration management for NASA’s CloudSat mission. “It literally takes my breath away to receive such a wonderful commendation, and it certainly puts the icing on the cake of my 40-plus years with Ball and all the people who supported me along the way,” said Barthuli. In 2011 Barthuli’s expertise was integral to a Ball Aerospace team that successfully recovered the Cloudsat spacecraft and science payload functions following the spacecraft’s battery failure. CloudSat, a multi-satellite, multi-sensor NASA experiment designed to reveal the inner secrets of clouds and improve weather forecasts and climate predictions was built by Ball for NASA’s Jet Propulsion Laboratory (JPL). The battery anomaly would have crippled the mission had the Ball team not determined how to transition the spacecraft into a new operating mode, known as Daylight Only Operations in November 2011. The spacecraft was then maneuvered back into its position in the A-Train constellation in May 2012. CloudSat is now in its eighth year on orbit after launching in 2006. Barthuli joined Ball Aerospace in 1971 after graduating from the University of Colorado with a degree in mathematics. In addition to CloudSat, she serves as the mission operations manager for the QuikSCAT satellite, also built by Ball for NASA. She is the first woman at Ball Aerospace to receive the NASA Exceptional Public Service Medal. In 2012 the entire Ball CloudSat team was recognized by NASA with a group achievement award. In addition, Ball’s Ian Graveseth and Brian Pieper were earlier recipients of the NASA Exceptional Public Service Medal award for their achievements on the CloudSat mission.